Heat oven to 375°F. Spray insides of 4 (6-oz) custard cups with cooking spray. Place custard cups on cookie sheet with sides. In medium bowl, mix brown sugar, butter, corn syrup, orange peel and rhubarb; divide evenly among custard cups. Top each with 1 biscuit. In small bowl, mix granulated sugar and cinnamon; sprinkle over biscuits. Bake 25 to 28 minutes or until deep golden brown; cool 1 minute. Turn upside down onto 4 serving plates; remove custard cups. Serve warm with ice cream. To prepare fresh rhubarb, trim the ends and discard all traces of the leaves (rhubarb leaves are poisonous). Scrub the stalks and cut into pieces about 1 inch in length. 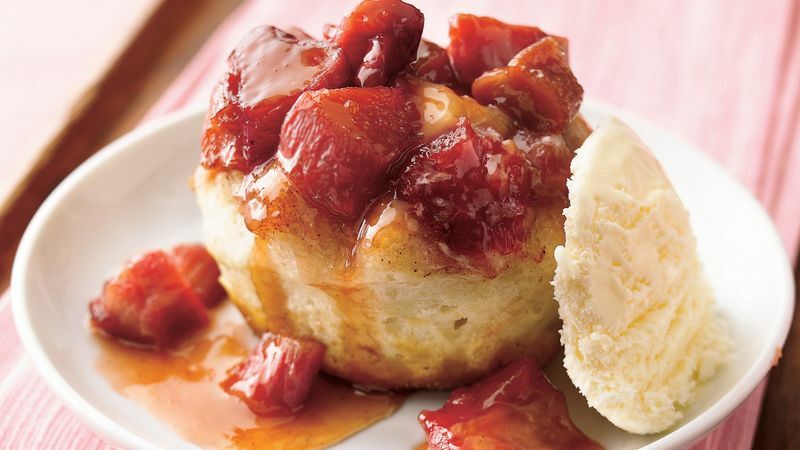 Instead of vanilla ice cream, serve these desserts with cinnamon ice cream.